I'm about to buy me my first Tele. Can u guys give me a advice for neck shapes, tried some out but just for about 20 minutes or so. What neck shape did Ted mostly use? what are the advantages of each shape. Did someone explored the Baja Tele? I thought about buying the baja and changing the neck pickup, i thought the 4-way Switch is interesting. The Roadworn also is on the maybe list. A guy in a guitar shop highly recommended a G&L, played actually really good. And of course used Telecasters, can u give me some advices there, what i have to watch out. I saw a Nocaster for about 700$, sounds to good to be true. Since everyone's hands are different I'd say you just need to try 'em out yourself to see what's the best for you. I have a '89 tele plus deluxe, the neck feels thicker than my son's Squier tele custom. Probably some sort of C shape necks. Both are nice but I think the neck on mine adds some 'fullness' to the sound (you can feel the vibrations stronger in my guitar anyways) and is a little more comfortable. I've tried V shape necks and didn't like them at all. I think those nocasters have thicker necks too... wow $700 sounds like a nice deal. The best Tele I've ever had was a mid 80s G&L ASAT. Fender offers so many different types like vintage, modern, american, deluxe and so on. As longer as I inform myself the harder it is to decide. Maybe i have to take my time and Play as much as i can in Shops and hopefully, there will be the one which i wont let someone take out of my Hand. thank u guys, i´ll send a pic as soon as i got her. Hey that's beauty. What is it exactly? a 52 reissue with a humbucker? or a 52 hot rod? 52 reissue with a humbucker made in Japan.. I bought one of these Fender Japan teles a couple of months back. I have to say that it is the best setup sweetest sounding guitar of this type (factory made, non-boutique) straight out of the box that I have owned. It plays well and sounds great from the get-go. Much better than some more expensive guitars. And they look great with that gorgeous honey coloured ash finish. This one is definitely a keeper. I didn't like the humbucker mount, it seemed overly fussy so I replaced the pickguard. I had to make it myself because these have slightly different screw positions and the off the shelf parts from the usual sources don't fit. I also replaced all the Philips head screws with slotted oval head screws, to be more in keeping with the period. It won't fool anyone for more than about a millisecond in view of the modern machines and bridge, and the Made In Japan decal on the neck. I don't know what the Humbucker is but it has a very warm sweet sound when played through my blackface Princeton Reverb clone which can be bright and crystalline. I will check the next time I change the strings. I will probably put a set of 11-48s on this. I think the factory fitted strings are 10s. I am glad you made a good purchase. Would you please provide the exact name, model since there are a zillion different Fender's in this category to choose from. Link below to a site in the UK which still has them on sale, where there is more information and photos. The store where I bought mine - Andertons- does not seem to have them currently. I am very happy with my decision. I didnt like the baja that much and the American Vintage was nice but about 600 Bucks more as the Japan reissue. The Japan vnt has a really nice c shape neck, not too thin for my taste, the sustain is unbelievable, Intonation and fret work is solid and as you said the humbucker creamy like Butter.. I thought of changing the PU at the beginning for a Gibson Vintage paf but right now no Need for that.. I play it with a set of daddarios 12 - 54 tuned to Eb it buzzed a Little bit around the 5-7 fret but After Setting the neck it is good, in Addition the nut was cut a Little bit but only for the low E string. Love to Play that Thing and Looks really good.. And even through my little Roland Xcube it Sounds nice cant wait to play it through my peavey amp. Sound example will follow..
Have a good New years eve guys.. Your response to my inquiry was very helpful/valuable. Thank you very much. Having played arch top guitars by and large all my life, I've neglected learning about Telecasters. 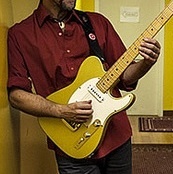 A love for Ted Greene's and Ed Bickert's playing as well as one of Ed's shining students, Lorne Lofsky, has gotten me interested in, and thinking about, Telecasters. When I read the posts and then go off into internet land and search around I invariably end up in "choice paralysis" as there seems to be as many models of Telecasters as there are vibrations along the length of a plucked string before it falls silent. I love the Tele. Funny how years ago when I bought mine I was originally thinking about getting a Gibson Les Paul, but I saw the Telecasters and just had to get one of those instead. I think every type/style of guitar offers something. It's interesting to play one kind then switch to another. The differences in tone and feel is nice and kind of fun too. I'm new to the forum. My two cents on teles: I use a 2001 Nocaster reissue with a Charlie Christiansen in the neck and A3 in the bridge, both lollar. The neck is a fat U shape and it took me a few months to get used to it, but I love it now. I've been touring heavily for 6 years and doing some work in Nashville this past winter. My life is changing and my wife and I are having our first child so I've decided to stay local, in the land of Lenny Breau, and focus on solo guitar. I am very excited about this and have transcribed and worked with a bunch of Teds arrangements and Lenny's, along with Bill Frisell and other guitarist to see what fits my "voice".